20 cm 111 p. : ill. Which famous writer goes best with a hot dog? 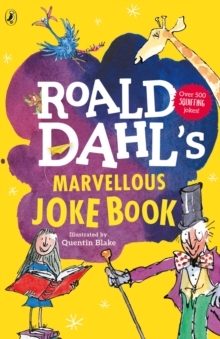 Roll Dahl of course!Laugh yourself silly with Roald Dahl's Marvellous Joke Book, filled with over 400 hilarious jokes, limericks and riddles, illustrated by Quentin Blake. Based on Roald Dahl's most famous characters you will be chortling away with Matilda, Charlie, George, The BFG, James and many more! Roald Dahl was full of fun and mischief, and LOVED all kinds of jokes- the sillier the better, like chocolate-covered chickens to grizzly, grouchy grandmas. This side-splitting book includes his own 'knock-knock' jokes, keeping all practising jokesters amused for hours!